We have been the peoples choice for Worcester movers,Shrewsbury movers and all of Central Massachusetts movers for over 60 years. At Philip P. Massad our family owned and operated business is committed to helping customers with their Worcester moving and storage needs. We are a top rated Worcester moving company and we have been serving Worcester and New England since 1958. From small apartment moving and residential moving in Worcester to huge commercial moves, we are capable of handling all types of moves for you at Massad Movers. 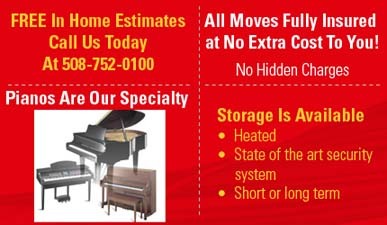 All of our moves are fully insured at no extra cost to you and we never have any hidden charges. Call the experienced moving professionals for your next short or long distance move. Clear up some space by storing it with us. Whether you need a short or long term storage unit our storage facilities are second to none. With our state of the art security system and police and fire monitored units your possessions are safe with us. If its time to move don't wait till the last minute! Get your FREE estimate today! 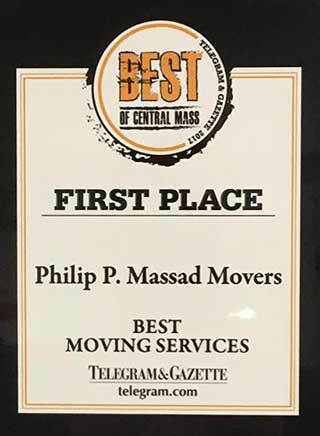 Pick up the phone and call Philip P. Massad Movers, the experienced movers, at 508-752-0100, you'll be glad you did.